The first story page of Lost Girls’ Society is now up and accessible via the Lost Girls’ Society main story page (above or to the right) or under the expanded Page listing for Lost Girls’ Society to the right. Anyone new to the site, this is a good time to be here, because you’ve come just in time for a new serial with an actual artist doing the illustrations. Anyone familiar with the site probably already knows how it works. Niar Saga was the first/previous serial fiction on this site, and you can find it chronicled and I might add easy to navigate via its main story page or the Pages navigation to the right. Lost Girls’ Society is a completely new story and separate from the other content of the site to this point, so no prior knowledge from elsewhere on the site is needed or really even that useful. It will be updating with story updates (with real art) on Mondays and Fridays around 10am Pacific Time, and I’ll be using Wednesdays to post Flash Fictions related to the setting following supporting cast tied to one or another of the three central characters. As for recent events, I’ve been really busy with a lot of things including gearing up for LGS and Lady Antimony’s 7 Holy Virtues Blog Challenge (you can get an idea of the awesome competition from the previous post in this blog). 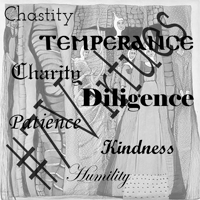 I of course wrote my 7 Virtues in the same setting as my previous 7 Sins, the Dark Hunter Trilogy. The Sins were much easier, but now all 14 are arranged in chronological order on the Dark Hunter About Page. Finally any time now I should be hearing if my family movie script, Yuki, has gone another round in the PAGE Competition or not. Really crossing my fingers on that one, it’d be an awesome opportunity to get my writing out and with other people actually involved in it–which really is all I’ve ever wanted. [The Seven Virtues Blog challenge is over and I’m even caught up on reading, so now for the shout-out to the rest of the field this round! Lady Antimony Presenting the incredibly awesome Virtues of Assassination in a vibrant and compelling 2nd person perspective of an instructor speaking to an aspiring protégé. Her work is rich and powerful, and she’s the host of the Challenge. My favorite thing about her posts this time around was the feeling of the ongoing narrative from post to post with a very colorful speaker—though perhaps we got the best feel for him in his irreverent interpretation of Charity. Suzanne Lucero Also posting on Antimony’s site, though with her own distinct Twitter account, Suzanne captures the Virtues with a sweetness and immediacy of everyday life—even when set in past times of human sacrifice—that is both compelling and natural. One of the amazing new writers I met through this Challenge. She had so many good and poignant posts it was hard picking a favorite, but ultimately I have to go with Kindness because it was such a perfect embodiment of the Virtue that I instantly fell in love with the character—really from her first spoken sentence. Margaret One of the most informed and historically grounded writers I know of, she weaves her words together with the weight of history and the power of presence in the moment. Each Virtue is tied to a specific Greek Myth, into which we are given a personal and resonant window that makes them more accessible. My favorite was Patience because of the special place I hold for the story of Orpheus, but her tragedies in particular were very powerful in this challenge including Daedalus’ Humility and Zeus’ so called Charity. Lissa Bilyk Another writer I met through the previous Seven Deadly Sins challenge, her writing is strongly character oriented and really gets you into the mindsets and emotions of her protagonists. For this challenge we followed a virtuous Heathcliff through the travails of love, presented in a most brilliant fashion. My favorite was definitely Patience for bringing the immortal feeling of love to life, though they all built so nicely on each other you really need to read the collection. Rosie Lane An excellent writer I also met through the Seven Deadly Sins challenge, and she brings to the Virtues an immediacy and every-day presence easy to follow even when it doesn’t always go where you think it’s going to. Her favorite is Patience and I’m inclined to agree with her, though Diligence deserves mention too in my mind. Still Patience had in my opinion the better character and so wins by a small margin. Rebecca Claire Smith An absolutely amazing fantasy author, I’ve loved everything I’ve read by her. And in commenting on her work I find a word I’m constantly inclined to use is “inspiring”. Her rich fantasy worlds and fantastic characters elevate her Virtues to a realm beyond the human and yet still grounded in common feelings we can all relate to. So many good ones, but I’ll have to say Charity is my favorite because of all the perfectly captured Virtues that one hit a real soft-spot for me that my imagination hasn’t let go of. The Gorm She’s got such a lovely frank style that tells it to you plain and is easy to run with. I’ve enjoyed all of her posts even though web-issues have kept me from commenting on them—which was painful because the writing really makes you want to engage with it. Far and away my favorite of her Virtues was Kindness though for the incredible sweetness of the scene—it’s enough to make you believe in happy endings again. Glitterlady A good friend of mine and well-rounded individual who unlike myself has talents that range well beyond her writing. You can tell a lot about her steadfastness and dedication to course that most of her Virtues were excerpted from her novel-in-progress, Torn, over at Book Country. So having read the Work In Progress already, my favorite Virtue was Diligence for developing the setting without actually being something I’d read before. Zade Forrest Another from the Seven Sins Blog Challenge who was prevented from posting to this one on time by life circumstances (a rather massive sounding move across country) but now seems to be making up for lost time. Chastity has been posted in the form of a poem, and his youth and wit with words make him worth watching. Kathy A newcomer for the Seven Holy Virtues Challenge, I’m glad she joined. She does a lot other than writing, but she writes so well I’m hoping it’ll be forgiven if that’s all I mention here. Her Virtues are presented in a range of environments from historical to modern to actual auto-biographical examples and are always engaging. Easily my favorite was Diligence because I’m Esther. Rebecca T. Little Vampires from her setting for “The Blood Thief” featured in her Seven Sins entries, but were more surprising to find in each of her Seven Virtues as well. There’s something about the Virtuous Vampire you don’t expect that makes it seem fresh and fun—to me anyway. I am fascinated by her world and want to know more about it. Chastity was good, but I think Humility may have been my favorite because of the religious vampire. Jamila Jamison I hadn’t known her before the Seven Virtues Challenge, but the activity of her blog on top of the fact that she’s working on a thesis at the same time is already enough to have me stunned. An author of the long form who brings her elegance and prowess with words to the short form in burst of passion and flashes of color that leave you longing for the larger world from which they surely came. Bryce Daniels A masterful wordsmith I met through the Seven Sins Challenge, a difficult move has him behind on finishing the Virtues but his words are worth waiting for and I believe he should be pressured to finish when things settle down for him. He is part Poet, and that part shines through even when not in control into a very elegant usage of words that are too beautiful to do justice here. I want to say Charity is my favorite of his Virtues he currently has up because the sentiment is so very beautiful, but unfortunately I just love the ‘assassination’ of a bowl of peanuts in Temperance not to give the favorite there. Surfing Madness A very diverse writer who I met through the Seven Sins Challenge. No two posts are quite alike, with changes in perspective, tone or sometimes even style. The unifying factor is the underlying creativity and the keen mind that is able to encompass so much. Hard picking a favorite since they’re hard to compare, but I think I like Kindness the most because of the canine perspective. JC Kitty Another from the 7 Sins Challenge, her writing seems to be coming from a larger story conveniently about the Sins and Virtues which seems absolutely fascinating to me. She has such a rich variety and depth of characters that it is amazing to piece together an image of the larger whole they’re all coming from. Seems a few Virtues are yet to be posted, but thus far my favorite is Charity because of the sweetness of Rehema. Emilia Quill An absolutely amazing fantasy author I met through the 7 Virtues challenge. Her worlds and creatures are so rich and very much alive, I can’t speak highly enough of her creativity or affinity for the fantastic. She’s one I’m definitely going to have to keep following after this contest is over. It was hard picking a favorite especially with her amazing imaginary beings, but ultimately I have to go with Charity for the sense of two Virtuous individuals in a room full of evil—and the hope that even when the count drops to one Virtuous individual good can win out. Anastasia held Tomoko’s writhing undead body pinned. Daisuke knelt next to her with tears in his eyes. The last vestiges of Tomoko’s humanity were fading. Anastasia couldn’t help smiling as she looked into the frightened eyes of the girl who hated her so much. Tomoko deserved a better fate than this. Anastasia wasn’t just calm, but actually at peace for the first time in five hundred years. She knew what to do, and in that clarity found she was finally ready to face hell. “You take care of him.” Anastasia whispered to Tomoko as she gave Tomoko her own life. Alhazard slammed the door behind him and fell against the wall of the alley. With a groan he ran his hands back through his hair and slowly regained mastery of his breathing. He methodically found and relaxed each of his tensed muscles, stiff from hours of holding back his urges and instincts. A few more twists, rolls, and stretches and he was starting to feel good again. Megumi was serving him well. If he could resist the urge to destroy her until he had mastered goodness—as he had mastered evil long ago—he could finally become God. Could she help him? It was the last thing Megumi had expected the man dressed like a punk to ask her. It just showed that everyone had some good in them. Of course she could help him, what kind of person would she be if she didn’t? But where to start? He wanted her to teach him goodness? Megumi smiled as she took his hand and led him toward her favorite café. Normally she was a lot more shy, but he had this lost look that convinced her he really did need her help. She’d start by being his friend. “I still can’t believe you knew she was implanting Dr. Edgar’s personality, and you went along with it!” Emma sighed in exasperation. ﻿Five. Six. And… Seven. Philip laughed as another of the madman’s shadow beasts fell to his knife. Those long hours training with the knife really were paying off, and it was particularly gratifying to find that the intelligence they got on the monsters’ weak points was accurate. The back-up plan would’ve been a lot messier. He’d used up the last of his ammunition on their way into the bunker, and the others needed the extra inside. Fortunately the choke point leading deeper into the bunker was really easy to hold. Philip could give the others all the time they needed. “Come on, Hoshino-chan! Just one drink!” Mr. Tamura flashed his winning smile. “I’m sorry, Tamura-san, but I really can’t. I have a lot of work to do for my classes and club.” Ms. Hoshino hugged her mess of papers and books to her and pushed her glasses back in place. “No, no. I really don’t have the time.” She was going to need an early start if her decaf tea was going to get her through her diagrams. Now’s a good time to get caught up on Niar Saga if you’ve perhaps fallen behind or are new to the site. Go ahead and click the link to the main story page at the top or the right, or jump right in at Level 1 or where-ever you left off. Tomorrow, the 6th, is the last Character Epilogue for Niar Saga and also the last page associated with the story I will write for this site. So the poll to the right for Favorite Character is the last Niar Saga poll on the site, and it closes on August 17th. So even if you’re not totally caught up, don’t miss the chance to cast a vote for your favorite character–because the opportunity to be THE favorite character in Niar Saga would be huge for any of them and whether they’d ask for your votes themselves or not you can be sure they all want them. Then there’s the matter of Lady Antimony’s 7 Holy Virtues Blog Challenge. Time’s running out to sign up, because posting starts this Sunday, August 7th. And finally after a week of Virtuous posts in the Dark Hunter setting you can look forward to the priemere of Lost Girls’ Society on this site Monday, August 15th. The same day I hear if Yuki is still in the running in this year’s PAGE competition.